Right before we left for Vermont, I realized that a fungal infection called powdery mildew had attacked my pumpkin plants. My friend who housesat for us treated the plants while we were gone with neem oil (which I believe is an organic type of pesticide — I did some very hurried research). Of the two plants, which had both sprawled all over the garden, one definitely didn’t make it, and the other is questionable. (I thank my friend for trying!) I really really hope it survives — I’m a lot more excited by the pumpkins than the tomatoes. 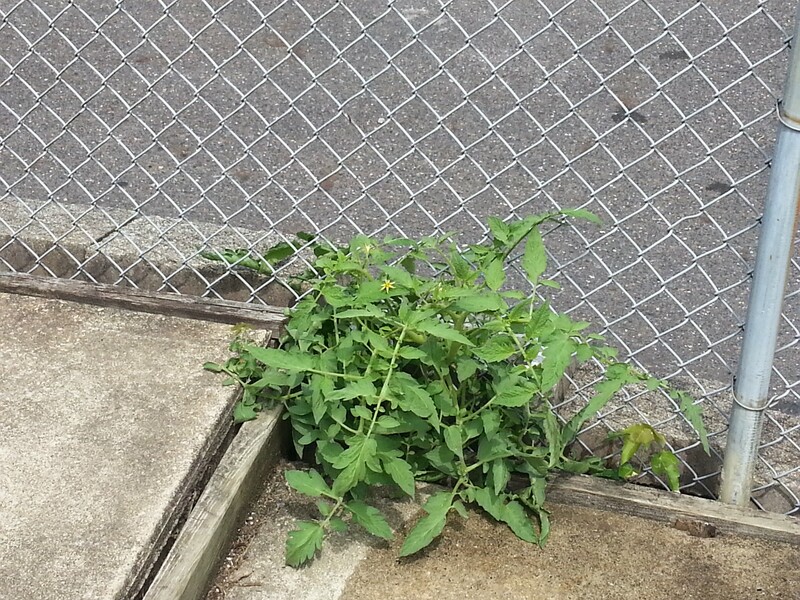 The tomato plants seem to have a problem as well, but I haven’t looked it up yet. The lower leaves are turning yellow and spotted, and dying. Maybe they just aren’t getting enough sun? At any rate, they are still producing tomatoes, though I only have one ripe one so far. 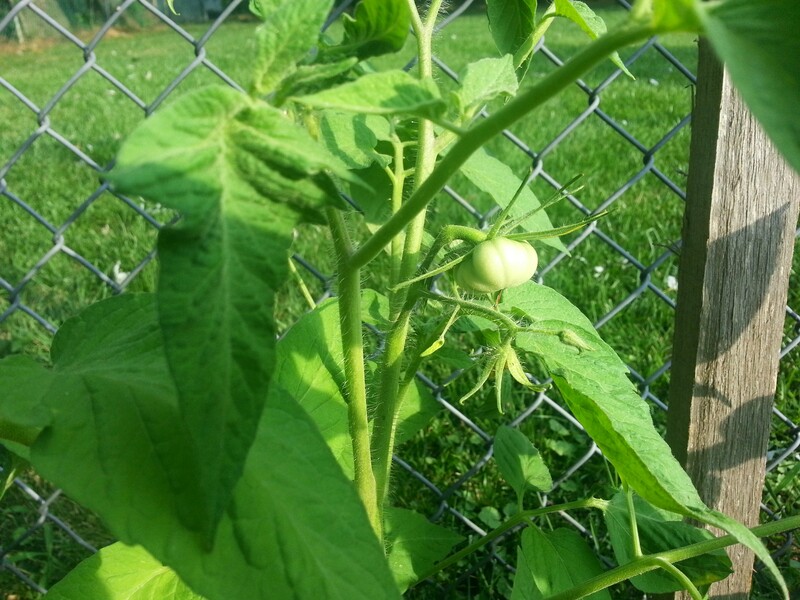 Squirrels got some of the very first tomatoes. Ironic that while I was in Vermont, reveling in delicious local fare and toying with notions of selling our house and buying a farm, my poor little attempt at a garden at home was going downhill. 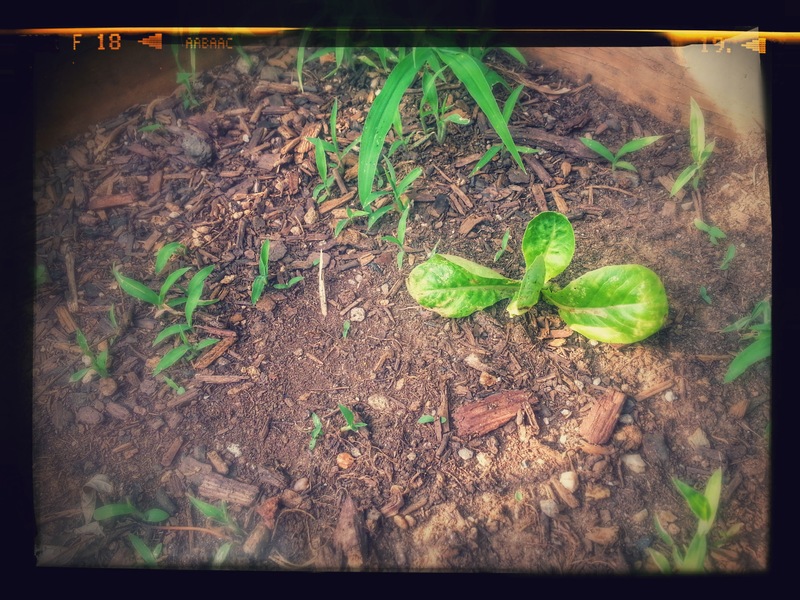 Of my lettuce seeds, one plant was harvested — I left it outside after picking it and forgot about it. 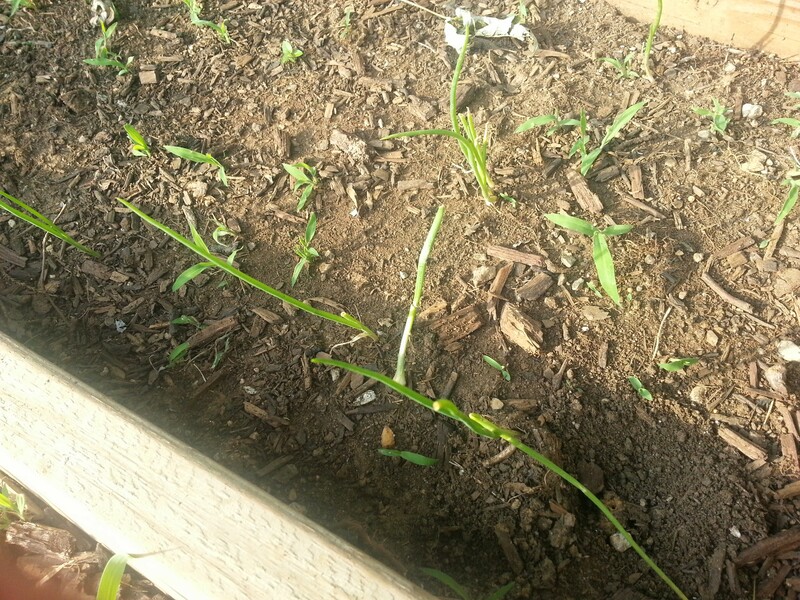 A lot of my onions appeared to have been dug up or pulled out by something, but three remain. I’m just not sure how I’ll know when they are ready to be harvested. The most exciting development is that a rogue tomato plant and a rogue pumpkin plant have sprouted in places where I didn’t plant anything. As my husband noted, it could be that a bird pooped the seeds out in those places. Or it could be from the day I let my son and his friend have some spare seeds to do what they wanted with them. Either way, the rogue plants are doing just fine without any intervention from me, which makes me feel… dumb. 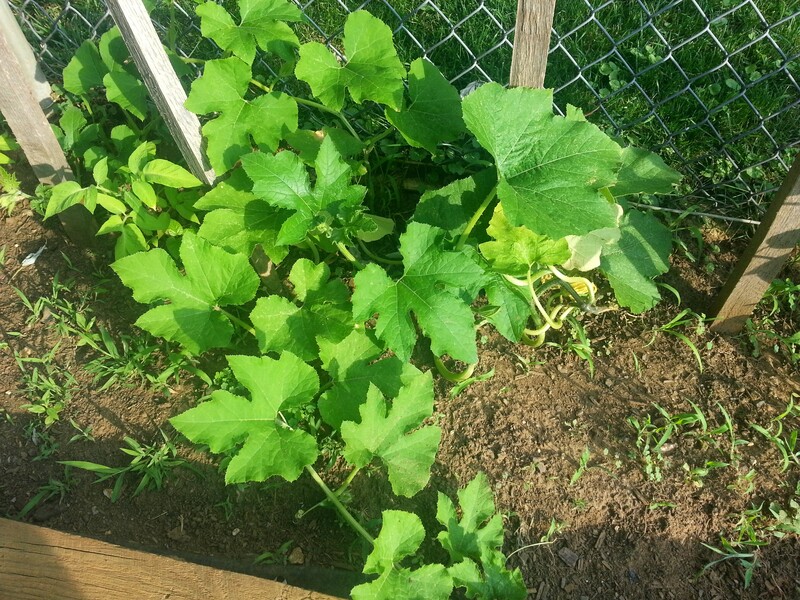 So maybe this will be a “rebuilding” and “learning” year for the garden, not so much a “bumper crop” year. I bought a big book on gardening at a library book sale in Greensboro, so maybe I will be better prepared next year. My husband made it look so easy last year! If you have any insight on powdery mildew, I’m all ears. 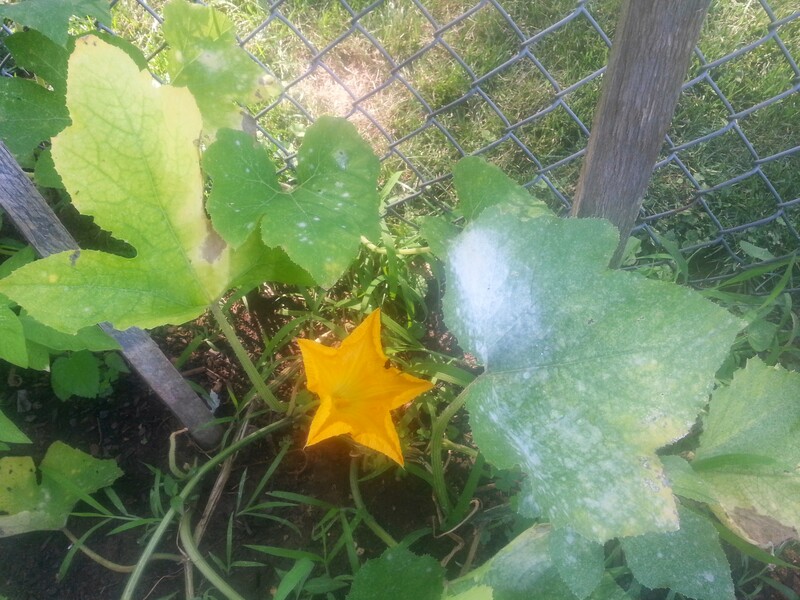 Andrew used some concoction with milk to spray on our squash plants when we got the powdery mildew – not sure it saved all the plants but it definitely salvaged some – Claire also tried it this year but I’m not sure how her’s fared after trying it out. You may also have chipmunks or squirrels getting your early tomatoes. If you see the chipmunks you can build a trap but its pretty sad – 5 gallon bucket filled half way with water and sprinkle sunflower seeds in it and then put a 2×4 plank to the top. Chipmunks will dive in for the seeds and drown themselves. Its a suicidal march for the poor critters but it does work. I think I may try the milk thing because I just don’t feel like spending more money on the neem oil. I’ll have to check in with Clare. Thanks! I hope your foot is feeling better! My pumpkins always get some mildew at the end of the season. I’ve never tried sprays but just cut off the worst looking leaves. I like to think I’m slowing down the process but by the end of the season all the leaves have it. The pumpkins that are close to a decent size still turn out fine, normal shape & orange. The pumpkins that are still teeny usually don’t develop. Maybe a spray would buy some more time and I would get more harvest . . . but that requires planning and I’m much better at just addressing what I see when I see it, ie “there’s mildew on that leaf and clippers in my hand . . . I’ll just cut it off” . . .
My guess on your tomato plants is that they are just winding down for the end of the season. Dying at the bottom, still growing on the top sounds like the fall to me! And since it’s been unusually cool for August recently the plants might change sooner than normal. Even though I still have a lot of flowers and some veggies into October, I think of late August as the beginning of garden clean up time. My point is . . . your garden experience sounds like a normal garden experience to me . . . rather than a garden failure. Do not grieve for those leaves! Thanks for the insights 🙂 I can definitely feel fall coming on around here so that all makes sense. And what I’ve been reading about powdery mildew jives with what you are saying. Unfortunately I don’t have anything besides the yellow flowers yet so I wonder if I will get any fruit at all. Ah well. I’m enjoying the whole process.